Submitted by sarosip on April 1, 2011. Last week the HCLU’s video advocacy team attended the 54th session of the Commission on Narcotic Drugs (CND) in Vienna. 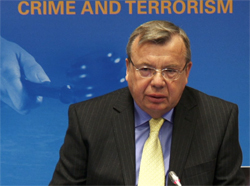 We asked both Mr. Yuri Fedotov, the head of UNODC and his NGO critics about the 50 years of drug prohibition – watch our short film to find out what they said! The HCLU is one of critics saying this convention is out of date. It is out of date because its main guiding principle is out of date. This convention, in the name of “the health and welfare of mankind”, attempted to limit the use of some drugs exclusively to medical and scientific purposes and decided to eliminate other forms of drug use. One of the provisions of the Single Convention say the chewing of coca leaves should be eliminated within 25 years: does Mr. Fedotov think that the aim to uproot an ancient Andean tradition within a quarter of a century was realistic? This convention created the global war on drugs, a war driven by the dangerous utopia of a drug-free world. 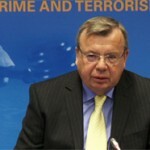 I disagree with Mr. Fedotov that either the global drug war or the dream of a drug-free world should be rejuvenated. How can we rejuvenate a public policy that was not evaluated properly? Despite the efforts of the international community, drugs are more available than ever. We know from countless studies that the global war on drugs undermines development in poor countries, fuels the global HIV epidemic, creates a lucrative and violent black market, fills prisons with non-violent offenders and devastates ethnic minorites all over the world. Rather than rejuvenating the convention, we suggest to rejuvenate the funding principles of the United Nations and have a fresh look at the international drug control system in the light of the Universal Declaration of Human Rights: does this system work? What are the intended and unintended consequences of the enforcement of the conventions? Are there feasible alternative policies to be considered by the member states? If you want to know the answers to these questions please join a new civil society campaign  led by Transform, that calls on the governments to count the costs of the global war on drugs!